The present world situation is one where people live under stress. The fast-paced work environment takes a toll on everyone’s life, leading to a severe reduction in their happiness, while simultaneously increasing the exploitation of the land. It isn’t of much help, for money can’t ever buy happiness. This leads to stress. Such an environment might be conducive to the production and wealth of a country, but it is definitely not contributing to the mental stability of a person. How much that person can actually handle pressure only decides how long it will take for him to buckle down. In our everyday lives, we see the youngest of people complain about a migraine, back pains, and 24×7 fatigue. This isn’t how it should be, right? It is your body’s way of telling you to let it go. Being an adult means having the freedom to go about one’s life. And, if at this stage you are burdened by your work, and forced into a tiny corner, your body is bound to revolt against the entire system. Take a step back, and admire what you have done, instead of going on and on about it. This would, in the future, prove to be a major catalyst to your suffering. But, unfortunately, we aren’t able to understand these signals. For we are too busy trying to work, to an extent that is inhumane, and simply, cruel. Stress can have many forms. It could include headaches, body pain, backaches, a continuous irritated mood, or a lack of appetite. It could also, under the most severe cases, lead to substance abuse, and even suicide, when the body is unable to cope up with the pressure it is piling on itself. Stress can destroy families, so take care that it doesn’t destroy yours. Stress, at times can be overwhelming and you may not even know when your stress overpowers your ability to handle it. Be careful! 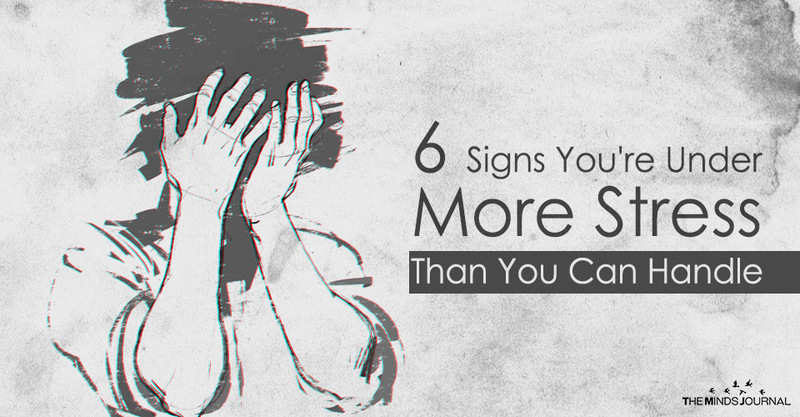 Here are some of the signs, that your stress has taken over you. Humans should generally sleep for 7-8 hours every night, which would benefit the body greatly, and keep it healthy. This is because a healthy body needs a perfect sleeping pattern, that works like a clock. It regulates the heartbeat and removed any sort of fatigue that might be encroaching upon it and also keeps the body fresh and free from diseases. A stressed person would suffer from lack of sleep or sound sleep. They would always be tossing and turning around in their bed, while people around them are sleeping. They would stay awake till late at night, trying to do everything that can make them fall asleep, but the more they would do, sleep will elude them more. And in the event that they do manage to fall asleep, they tend to wake up after a turbulent sleep, feeling extremely twitchy. A healthy person would focus more on veggies, and healthy food which is laden with protein, carbohydrates, and fat in equal amounts, that would build up the muscles, and keep the body free from illnesses. This also brings into question the topic of fitness. A healthy man is always fit. Always willing to go the extra mile, and always willing to substitute a junk burger, with a fruit salad.